I have been driving since August 2004 - I am one who learned driving exactly after I turned 18, and took a licence 40 days after my birthday. Its been 6 years of driving now, and during this period I have driven in Maharashtra, a brief stretch in Gujarat, Karnataka, Tamil Nadu and Kerala. Most of us would be familiar with the dog and the cow story. There is one habit commonly seen among drivers in Kerala, which is awfully similar to the dog in the manger. Many drivers in Kerala believe its extraordinarily safe to drive at 30-40kmph in the middle of the road, and not giving way to faster vehicles. This is one very common scene these days on the few four-laned roads in Kerala. The trick here is, the thumb rule in Kerala is (of course, this rule is valid across India) not to overtake through the left. AND, drivers in Kerala meticulously follow this rule. Most, so-called, safe drivers do not give way despite repeated honking on the highways - the typical 'do not eat; also not let others eat' attitude of the dog. You should be wondering whats wrong with this! But, the catch is here. Many drivers in Kerala follow this habit while overtaking. 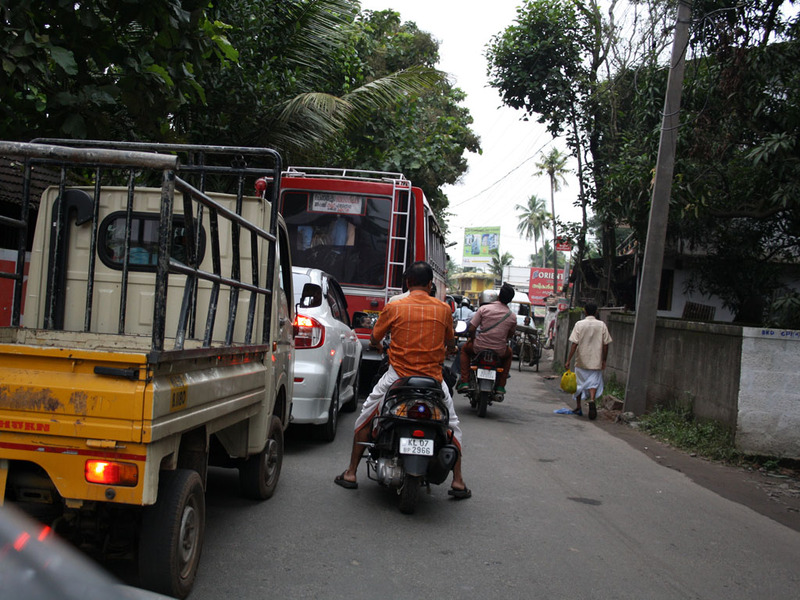 The commonest style of overtaking in Kerala is: Honk when there is no space to overtake. When there is no vehicle in the opposite side, pull immediately to the overtaking lane a.k.a. right lane. Keep driving at the same pace, which is essentially the same as the vehicle you are trying to overtake. Do not downshift, do not accelerate more. You keep going at the same pace, and the vehicle out of its own scare would pick up a km/h or more extra speed. After running parallel for about 2-3 minutes, you finally go ahead of the other vehicle. AND, by this time, there would be vehicle on the opposite side. So the vehicle following you would be one vehicle behind - this habit overlaps with Habit #1. Habit #3: Left or Right, Centre is the best! This is not exactly a Keralite habit, but is seen among most drivers in India - especially bikers and auto drivers. The habit is to drive in the middle of the road. In any traffic block, especially on two lane roads, the middle lane (Err! the middle portion of the road) is certainly occupied by bikes and autorickshaws. Notice the image below. As you can see, the road is a narrow two-laned road. (Did I mention this: This is the starting portion of NH17!) All 'respectable' vehicles are lined up on the left side, and moving forward in an orderly queue. See where the bikers are. If you notice the image properly, vehicles coming the opposite direction can be seen. What benefit do bikers obtain by this? (Other than delay others). Bikers should be charged heavily for such dangerous driving habits - you are only forcing other to drive even badly after the jam. You would be wondering what is this all about! Did you know that Indicators consume energy. (Honestly, I never knew this!). People in Kerala prefer switching on their turn indicators well after they actually start turning! Isn't the Indicator actually indicated to warn the person behind that you would be turning? Whats the use if you switch it on after you actually start turning? This is the most peculiar habit I have seen in Kerala. I might be wrong to squarely blame Keralites alone on this, and this might be existing elsewhere as well. "Safe Approach" is a tactic used by people who are about to enter the main road from a by-lane, especially when the road approaches at a 90-deg angle. Say, the person driving down the bylane needs to enter the main road and travel to the right i.e., he need to cross a lane to get on to the correct lane. In normal practice, the driver would continue perpendicular to the main road, stop at the intersection. Look on both sides, and once the road is clear or has adequate space, enters the main road at a 90-deg angle and bears a sharp right to enter the road (as shown to left in the image below). But, most drivers (especially bikers, and people who have just upgraded to a car from a bike) in Kerala have a different practice. They stick to the right of the road they are driving on. Then enter the wrong lane on the main road irrespective of traffic, and then suddenly change over to the correct lane, irrespective of whether the lane is empty or not. The image above would give an idea of how this "safe approach" works. There has been situations where I've just let off my car and let what ever happens! You might be driving at a decent pace (read, above 60kmph), when a reckless vehicle (read, private bus) comes on the opposite side. You suddenly see a vehicle running coming in the opposite direction on the left side of the road - literally sandwiched between the devil (private bus) and the deep blue sea! India's most literate state needs to go a long way in improving road etiquettes. While I still have more points to cry on, I reserve them for future posts - afterall, I need to keep this blog busy. Don't I? So wait for the next part of ramblings about Kerala's driving habits. I am sorry to have generalise my observations pertaining to certain sadistic individuals - but a good share of the blame has to be on driving schools in the state - had they been training proper etiquette, the scene would have been far different. From what I understand, most accidents in the state happen when drivers get fed up of the habits mentioned above, especially Habits #1 & #2. If you are in no hurry, that doesn't mean the guy behind you too isn't - give way. though none of these are claimed exclusively by keralites. ( or we are better when chennai like cities are considered). Also, energy is not only saved on indicators!, Head lamps. Even Merecedes users are saving on petrol by keeping head lamps off, even when its impossible to see the road. And these fellows are pledged to alert those operate their drive/ head lamps, as they're concerned of the "national wastage" others make by burning extra litters of petrol burned for head lamps!!! we cannot blame, no one is proffessionaly trained to drive, not even driving instructers.